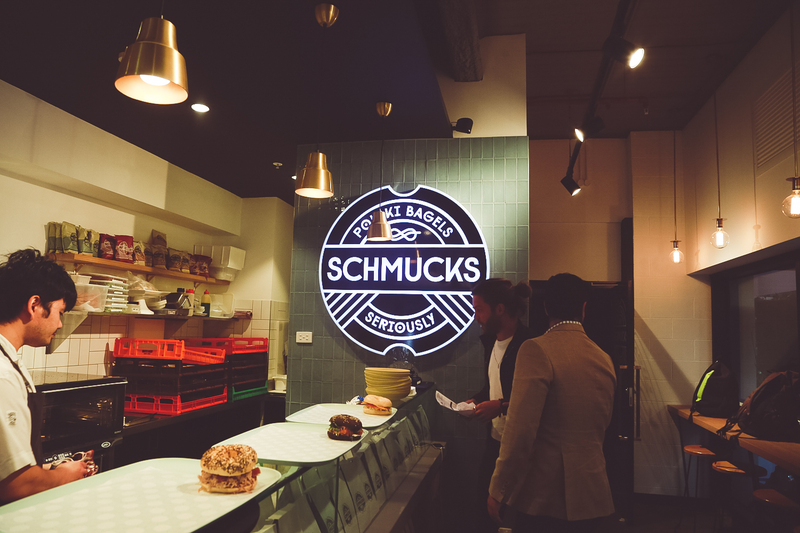 Any bagel place that calls itself ‘Schmucks’ knows what’s up. The tongue-in-cheek use of Yiddish – the word means something akin to ‘jerk’ – made me smile before I even arrived at Schmucks Bagels. Schmucks is tucked down a laneway I’d never been to, Guests Lane, and fills a much-needed gap in the market near William and Little Bourke. They’ve repurposed a sad, bare courtyard into cantina-style outdoor seating outside of their shop. This is going to be the go-to place for hordes of office workers in the area come lunchtime, but I was lucky enough to attend their nighttime media launch. The launch party was one of the best I’ve been to this year. (I know, I always say that, but it’s true!) 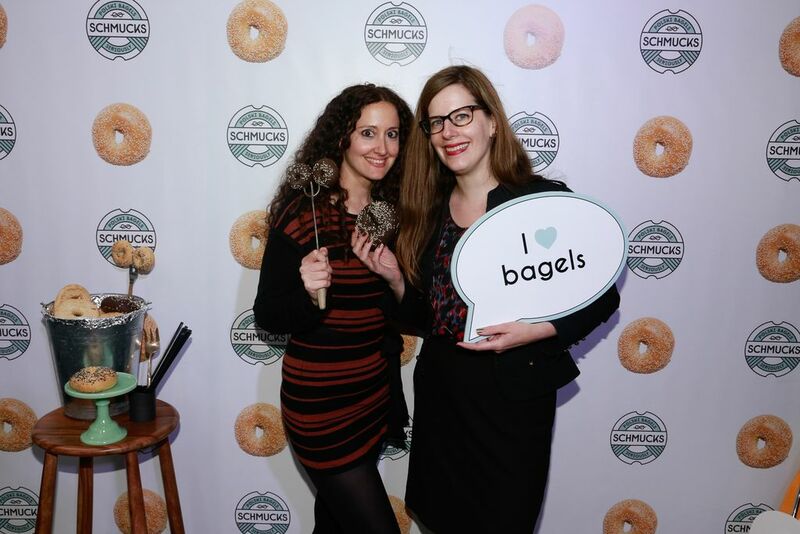 Rather than serve up mini bagels or large ones cut into pieces, the geniuses in Schmucks’ kitchen decided to serve up deconstructed versions of the bagel fillings, canapé-style. Founders and all-around mensches Jeremy Marmur, Ben Avramides, Tommy McIntosh, and Simon Winfield were on hand to kvetch with the crowd. You could tell they were immensely proud of their endeavour, especially when they passed around celebratory vodka shots for a toast. L’chaim! Their menu is hilariously cheeky. You simply can’t have bagels without salmon, and the two offerings are called ‘Love u Lox’ and ‘Miso Schmick’. I must say I enjoyed having to translate the Yiddish for my Israeli friend. (‘Schmick’ means ‘cool’ – as in: ‘You’re looking schmick’.) We use a lot of Yiddish in the U.S. without even realizing. For example, the beef brisket is called the ‘Schmoozer’, a word I often say. Talk about chutzpah: they even have pork on the menu, dubbed the ‘Oy Vey.’ (The joke is that since Jews aren’t supposed to eat pork, they might use that exclamation – akin to going ‘OMG’ — when they see it on the menu.) But vegos, don’t worry: the ‘Hippie-Slicker’ features turmeric-roasted cauliflower – a standout of the night. Schmucks is delightful. The menu is hilarious, even to a shiksa like myself; the ingredients are fresh, the flavours balanced; the location is the perfect spot next time you need something in the area. It’s even worth schlepping across town for. Co-founder of The Plus Ones, Theresa loves that she knows more Yiddish than her Israeli friends, even though she’s a goy. Disclosure: The Plus Ones were invited guests of Kate & Co.